Sunday April 22nd 1883 It was a cold windy disagreeable day I was busy about the work all the forenoon and read a little in the afternoon and evening. Monday April 23rd 1883 I did not have the washing done this morning it was so cold and bad I was busy about the house a good part of the day and worked on edging some. 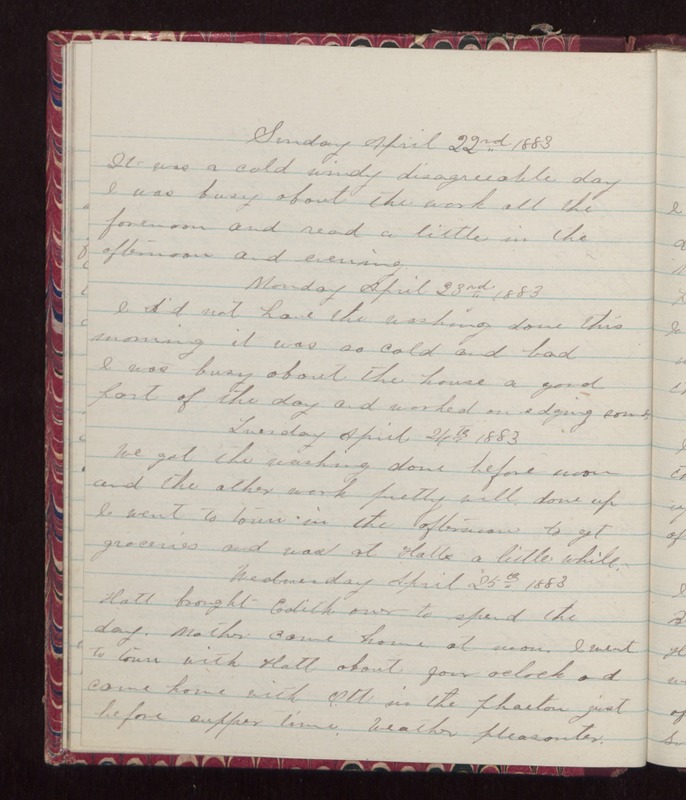 Tuesday April 24th 1883 We got the washing done before noon and the other work pretty well done up I went to town in the afternoon to get groceries and was at Hatts a little while. Wednesday April 25th 1883 Hatt brought Edith over to spend the day. Mother came home at noon. I went to town with Hatt about four oclock and came home with Ott in the phaeton just before supper time. Weather pleasanter.